This may have been Saint Joseph’s first pipe organ, a small, two manual tracker action instrument, built by E. & G. G. Hook & Hastings of Boston in 1873, as their Opus 689, and installed in Christ Episcopal Church at Seventh & Francis Streets. Like most American-built pipe organs of this period, it was one of several stock models built and sold by the company. A cut and specification of the instrument from an 1871 company catalog is reproduced below. Since trained organ service technicians on the American frontier were few and far between, these self-contained organs featured simple, rugged mechanics. Although this organ had an Oboe stop, some builders typically did not include “reed” stops on these smaller organs, usually destined for remote churches, because they were more temperamental and required more frequent tuning than the “flue” pipes. In addition to a dearth of service technicians, some rural churches did not have access to municipal electric service. For these reasons, several Midwestern builders continued to build tracker action organs, in addition to “modern” electric” action instruments. The Hinners Organ Co. of Pekin, Illinois, built tracker organs until 1930. All but approximately 500 of the company’s total output of almost 3,100 organs were tracker action. George Kilgen & Son of St. Louis continued to offer two stock tracker action instruments as late as 1926, which were marketed as “rural direct action” organs, perhaps because tracker action seemed outmoded by that time. Because these early pipe organs were often the dominant feature in smaller churches, the architectural style of the case generally carried the balance of the space. This organ was the only item to survive a fire, which destroyed Christ Church on Christmas Eve in 1876. A temporary shed was built around it to protect it from the elements until a new building was constructed in the following year. It served that parish until 1895, when the present organ was purchased and installed. It was then sold to the Hundley Methodist Episcopal Church, South, at 22nd & Colhoun, where it continued to serve until that congregation merged with Trinity German Methodist Church to form Ashland United Methodist Church in the early 1950’s, after which it disappeared. During the next 62 years, the prominent Boston organ firm of E. & G.G. Hook & Hastings, later known as Hook & Hastings, built and installed, rebuilt, enlarged and moved a total of seven pipe organs in Saint Joseph, under 10 different contracts. The second installation was First Presbyterian Church in 1878. Listed at two manuals and 27 registers, this was a relatively large instrument at this time. In that same year, E. & G. G. Hook & Hastings installed a new organ in Trinity Episcopal Church in Atchison, Kansas (Opus 863), (below) which was removed many years ago. The third St. Joseph contract was Opus 1220, installed in 1884 in the Francis Street Methodist Episcopal Church, South, on the northwest corner of 7th & Francis. When the church built a new building at 12th & Francis, this instrument was sold to a church in Brookfield, Missouri, however, the church’s new organ was also built by Hook & Hastings. 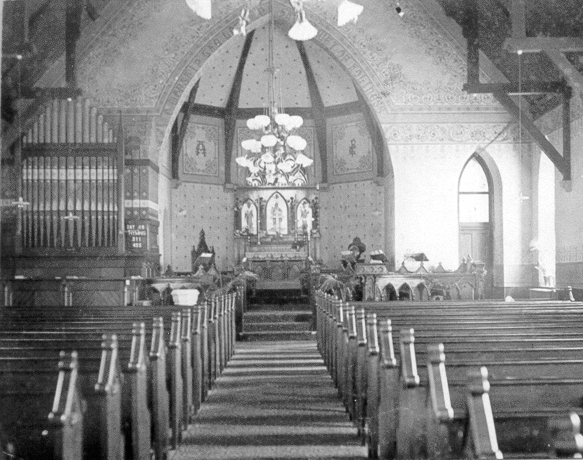 Other Hook installations included the 1896 Ellingwood residence organ, which was sold to First English Lutheran Church, the 1904 organ in Tabernacle Congregational Church at 13th & Jules, and the 1907 installation in the First Church of Christ, Scientist. The company's last official contract in 1935, closing 109 years of business, was for the conversion of the tubular-pneumatic action in the 1906 organ in Francis Street Methodist Episcopal Church, South to electro-pneumatic action. Easter 1898, Francis Street Methodist Episcopal Church, South, NW corner 7th & Francis. Dr. Wilbur Fisk Packard, Pastor (Dr. Wallace McDonald’s great-grandfather). In the background is Hook & Hastings Opus 1220, 1884.